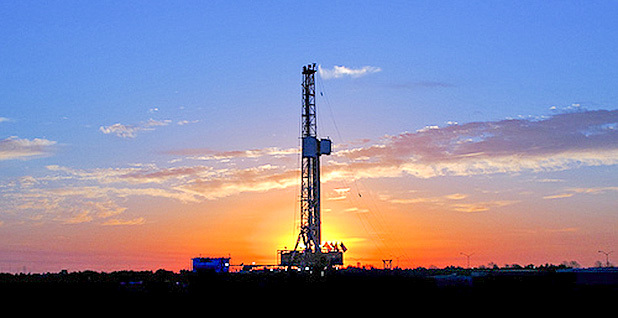 A natural gas rig in Euless, Texas. Attitudes toward natural gas are hardening in the environmental community since Donald Trump was elected president. Photo courtesy of the Pacific Northwest National Laboratory. Environmentalists who have waged a fight against natural gas as a bridge fuel away from coal say they'll make their opposition louder as President-elect Donald Trump's administration pushes for even more pipelines and production. Trump is expected to try to fast-track pipeline approvals and boost energy infrastructure as part of a broad package out of Congress. President Obama and Democratic nominee Hillary Clinton, in contrast, argued that natural gas should serve only as a transition fuel as the electric system shifts off coal. But climate activists have opposed the scale at which power companies have begun to rely on natural gas and have pushed for a faster move to renewable electricity. Their challenges to a growing network of plants and pipelines have now become more urgent, they say. "There's a lot out there that Trump can't change," said the Sierra Club's Dirty Fuels campaign director, Lena Moffitt, noting that renewable power costs will continue to decline quickly even as the Republican administration rolls back climate goals. But, she added, "the gas industry seems to also be aware of that and is racing to lock in as much continued demand for gas as they possibly can, we think with the direct intention of undercutting." That's why the Sierra Club has been increasingly focused on fighting natural gas infrastructure investments, "especially over the next couple of years, so that renewables can come in and beat them out from an economic perspective," Moffitt said. Gas advocates counter that the "keep it in the ground" movement against fossil fuels is shortsighted. 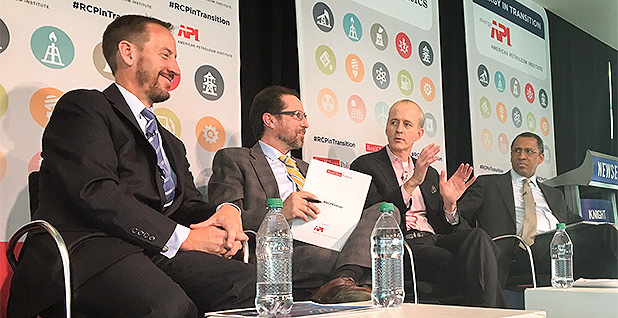 "We have been part of the solution for this administration to reach a lot of their climate goals for Paris," said George Lowe, vice president of federal affairs for the American Gas Association, at a post-election event last week. Burning natural gas creates about half the carbon dioxide emissions of coal, but the process for extracting and transporting it emits a more potent greenhouse gas, methane. Advances in hydraulic fracturing, or fracking, have given the United States access to deep supplies of cheap, lower-carbon fuel but also have raised water-quality concerns around the country. Rapid gas development has prompted some grass-roots revolts against fracking, spurring efforts to ban the process even in conservative cities like Denton, Texas. Environmental advocates are now opposing Federal Energy Regulatory Commission approvals of pipelines that they say are duplicative and calling for stronger environmental reviews. At the more local level, they are pushing for tougher water quality permits. And they are building alliances with even conservative landowners who are "aghast we would allow fossil fuel companies to come in and take their property without their approval for private gain," Moffitt said. "We're in for some rocky times; there's no doubt about it," said Terry O'Sullivan, president of the Laborers' International Union of North America, which has been advocating for states to use more natural gas to comply with federal climate standards. LIUNA places more laborers in jobs to build pipelines, although the group also works in renewable infrastructure development. "We're going to have an energy-friendly president," O'Sullivan said. "We're going to try to capitalize on that ... and the environmental groups will do what the environmental groups are going to do." From left to right: George Lowe, vice president of federal affairs for the American Gas Association; Carl Cannon, Washington bureau chief of RealClearPolitics; Michael Flannigan, senior vice president of global government affairs for Peabody Energy; and Kevin Avery, federal government affairs manager for ConocoPhillips discuss the future of the energy industry at a postelection event at the Newseum in Washington, D.C. Photo by Emily Holden. The Sierra Club in late September announced a nationwide $5 million plan to fight natural gas plants and pipelines (Greenwire, Sept. 29). The group also has ramped up efforts in the Southeast and wants to galvanize local opposition to the Atlantic Coast and Mountain Valley lines, which would run along similar routes to that region through the Mid-Atlantic. Nadia Steinzor, Eastern program coordinator for Earthworks, said climate activists will play up what she called Trump's "desire for a federal power grab back from the states," which could anger states'-rights Republicans. Last week, in a win for pipeline opponents, the West Virginia Supreme Court ruled in favor of a couple challenging Mountain Valley pipeline surveyors who wanted to access their property. The Natural Resources Defense Council is deciding how to pick its battles under a Trump administration, said Chief Program Officer Susan Casey-Lefkowitz. "We're marshaling our resources right now to take a hard look about where we will need to go to court," Casey-Lefkowitz said. The outlook for natural gas would have been bright under either a Trump or a Clinton administration. Under Clinton, U.S. EPA's now-likely doomed Clean Power Plan would have had a much better chance of moving forward. The American Petroleum Institute just weeks ago issued a report touting the environmental benefits natural gas could offer to states aiming to complying with those power-sector climate rules. Clinton also would have boosted energy infrastructure, and O'Sullivan said his group could have worked well with her on natural gas policies. Environmental groups, on the other hand, had hope for a Clean Power Plan 2.0 under Clinton that could have tightened standards and eventually edged states away from natural gas and more toward renewable power. Still, they believe that even without the rule, the utility sector will continue to decarbonize as wind and solar costs decline. "The market has really dictated the direction that the U.S. has gone in terms of natural gas development," said Dan Whitten, a spokesman for the Solar Energy Industries Association who previously worked for America's Natural Gas Alliance before it merged with API. "That's also been true, by the way, of the vast growth in demand for solar energy." The solar trade group expects solar to quadruple over the next four or five years. EPA Administrator Gina McCarthy said this week that even without the Clean Power Plan, she expects clean energy to keep growing (E&ENews PM, Nov. 21). Renewable power costs fell so much faster than expected over the last year that many states were already set to achieve their EPA power-sector carbon goals. Energy experts expect that momentum to continue no matter how much Trump favors fossil fuels. They also expect conservatives to leave in place tax credits for green power. The coal industry, however, is also calling for subsidies for carbon capture and sequestration advancements, which could rile free-market politicians. Nick Loris, an energy economist at the conservative Heritage Foundation, cautioned against stacking subsidies on top of one another and encouraging a massive build-out of infrastructure for any energy source. "That's something that should be of concern to both sides of the aisle," Loris said. Even with solid projections for zero-carbon power, green groups say they need to put up obstacles to gas infrastructure, both to ensure against environmental damages and to slow climate change. At a summit in Natural Bridge, Va., the weekend after the election, around 170 people gathered to strategize about how to fight the Atlantic Coast and Mountain Valley pipelines. Lew Freeman, chairman and executive director of the Allegheny-Blue Ridge Alliance, said there was "an extraordinary sense of energy and reinforced commitment." The utility Dominion is planning the Atlantic Coast pipeline, which would move natural gas from West Virginia through Virginia to North Carolina. Facing environmental concerns, Dominion redrew a previously planned route for the pipeline. That engaged more landowners, Freeman said. "There are more people now involved in this fight than were a year ago, or even six months ago, when we had an earlier summit," Freeman said. The group includes people who "have never been involved in a public policy issue of this nature," as well as those who consider themselves conservationists and have concerns about pipelines moving through the George Washington National Forest, Freeman said. "It has brought together conservatives and Democrats and Republicans and a lot of other stripes together over a common cause," Freeman said. A spokesman for Dominion has said the pipeline would enable the company to power cleaner-burning natural gas plants in order to cut carbon emissions and save consumers money. The Democratic governors of West Virginia and Virginia support the pipeline (Greenwire, Sept. 19). Those two pipeline projects will still be under review when Trump takes office, and ClearView Energy Partners expects the Trump team to rescind greenhouse gas guidance that environmental advocates and EPA have used to contest FERC environmental reviews. Scott Janoe, a lawyer who represents oil and gas companies in Houston for Baker Botts, said environmentalists may find a more receptive audience in certain states than under the Trump administration. But "environmental groups have not been shy about challenging projects over the last few years, so there's no reason to think that things will fundamentally change," he added.